Home / Education / Review / Shopkins Happy Places - Building Their Own Dream Home. Shopkins Happy Places - Building Their Own Dream Home. We have become some what obsessed with Shopkins lately. I must admit there is something about these little plastic toys that are addictive and make little people go crazy when they see them in shops. Even though our little collection of Shopkins is fairly small I know that it isn't going to take long for the obsession to set in, she already has her eye on more Shopkins. They are pretty cute, so it's not hard to see why she's becoming obsessed. When we discovered that a new app was being released we couldn't wait to see what it was all about. Moose Enterprises and Kuato Studios have launched their first official app, Shopkins Happy Places and we honestly couldn't be more excited. The app is aimed at children age 4 + and even though my daughter is three and half we decided to download the app anyway, and to my surprise she figured it out very quickly, probably quicker than I did. The Shopkins Happy Places app is aimed at children who want to build their own dream home. Not only do they have a bathroom, bedroom and living area but a kitchen as well. We found the app so easy to setup and we both had loads of fun moving into the Happy Home filling our rooms up with all our Shopkins. I think that children born into the digital generation are lucky and are far more intelligent that we ever were. My daughter, like other children are drawn to technology like moths to flame. It doesn't seem to matter whether it's a smartphone, tablet, electronic game or the television. As soon as it lights up, their eyes do too. Have you ever watched a young child use a tablet for the first time? It's actually quite fascinating to see how quickly they can figure out how to navigate around the app or tablet. I sat with my daughter with this app and I was quite surprised at how quickly she figured out how to get around the app and even told me that I wasn't playing her game properly. Well, that certainly put me in my place, that's for sure. The Shopkins Happy Places app is set in a fictional town called Happyville. The game begins with Lil’ Shoppie Jessicake who loves to wear pink and rocks a lovely blue hair do move into her new home. Once Jessicake has moved in and her first parcel is opened that's where the fun can begin and you can allow them to unleash their inner interior designer. Children can help decorate and design the inside of their own Happyville house by collecting ‘Petkins’ which are cute furniture and everyday items from a number of different themes arranging them as they wish. Whether that's designing a bedroom equipped with all the necessary accessories such as standing mirror, lamps and cushions or putting their own stamp on in their brand new kitty kitchen with some of the most adorable kitty accessories. There are three themes to consider when it comes to collecting accessories for their dream home. The Dreamy Bear Collection that has been designed especially for the bedrooms with over 31 different accessories to collect. You can choose from beds, trunks, dressing tables to the smaller accessories like vases, makeup cases and cute cushions. The Kitty Kitchen Collection is a range of accessories designed for the kitchen which happened to be my daughter's favourite collection because she adores cats. With over 44 accessories to collect you really are spoiled for choice. You can choose from the practical items such as a oven, kettle and dining table to the more fun ones like a kitty cookie jar, eggs cups or bread bins. Lastly The Puppy Palour Collection have been designed for living areas and décor with over 46 to collect you be sure to find something to add into their dream living space. As they go through the game and find their feet they will be able to earn more Petkins, Happy Places and Lil’ Shoppies characters (Poppette, Coco Cookie and Bubbleisha). And with their Lil' Shoppie designing their dream home players will be able to see what their characters are thinking as a little thought bubble appears above their head. They will soon figure out when she wants to do. Jessicake likes to sleep, eat, drink and apply lots of lipstick. My daughter enjoying buying Jessicake lots of pizza slices. As soon as you have done things with your Lil' Shoppie 25 times you will get a parcel delivery containing three new Petkins. My daughter got really excited when the new boxes needed opening, as in the same way as the traditional shopkins, the items inside can be common, rare or ultra rare. She has managed to find a few super rare items so far, and got herself very excited when the words appeared on screen! Obviously the more you do the more you can collect but you are also able to buy a box of 5 Petkins for £1.99 as an in app purchase which we did a few times. As well as following the Lil’ Shoppie’s thoughts, you are also set occasional House Goal challenges which involves slightly more complex tasks to complete in a specified sequence to earn a specified prize. With a little help, my daughter set to task straight away. As you go though the tasks and the sequences the apps unique TalesMaker technology records key moments from the play session and then presents these to the child as a record of their day, something that my daughter liked to play with. Children are able to alter the images, their sequence, the captions and even add their own words. These images are then added to your device. I do have a feeling my camera roll is going to get crazy. For me I thought that the Grown Ups' Corner was a brilliant part of the app. It's a part of the app designed just for grown ups where you can access by entering a four digit code. They do ask for your year date of birth, but it's up to you what you enter. In the Grown Ups' Corner there are quite few tasks you can change such a limit their time using the app, asking permission to save pictures to your device, adjusting the sound and music, and even restoring any purchases. I am a parent who will allow their child to have screen time and I wouldn't normally allow her no more than 20 minutes at a time. So the Grown Ups' Corner gets a big thumbs up from me. This app is probably one of the best thought out apps aimed at 4 year olds on the market at the moment. It's an app that is engaging with the bright, colourful characters and illustrations that will be sure to encourage an interaction. My daughter found navigating herself around the app and it's content easy and thoroughly enjoyed the fact that there was just so much to choose from, we are still getting through some activities. What the little one thought? As I'm sure you can imagine my daughter absolutely loves Shopkins Happy Places and sometimes I struggle to get her off it! I'm really glad that my daughter took to the app pretty much straightaway and this has become her go to app now, which means I can get rid of all the ones that have those annoying adverts! 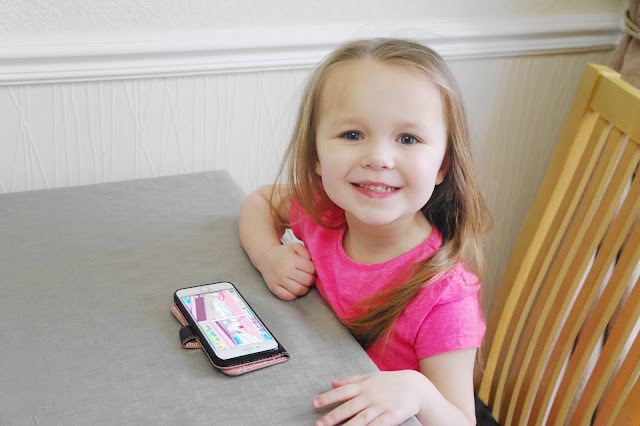 When I asked my daughter what she liked most about the app she said that she loved getting the accessories for her Kitty Kitchen and would sit there for some time happily playing. But while we discover all the new activities not only is my daughter is being entertained but she is learning! As a blogger to a little one we are always been offered opportunities to try new apps. There are a countless number of amazing apps that can actually help enhance your child's development, promote motor skills, enhance memory and pattern recognition. I must admit it took me by surprise at how quickly my daughter took to the app, but I am in no doubt that this app is helping with her overall learning skills, whilst making it fun. But as with anything, screen time should be limited everything in moderation is key. 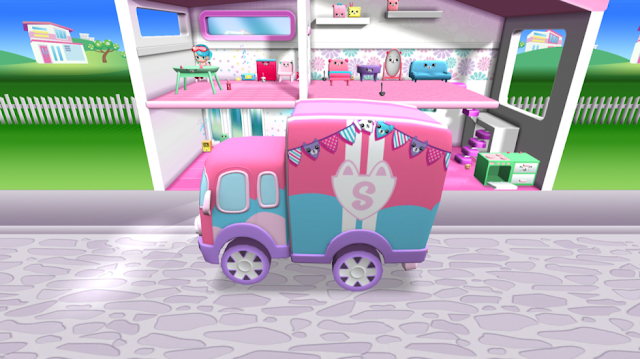 You can download the Shopkins Happy Places app here in the App Store. 5 comments on "Shopkins Happy Places - Building Their Own Dream Home. "